Rest in peace dear Tag. His name is Tag, short for Tag-a-long and we met when he was a mere puppy. Even then, his paws were as big as basketballs and his drool could swamp a small boat. His allure is magnetic and for many he is the most popular attraction on the island. My grandchildren could not wait to see him again. He seems to have a built-in barometer for age appropriate play. He was gentle with my 6-year-old granddaughter, a little more “playful” with my 8-year-old grandson. He almost knocked my husband over when he jumped up on him because my husband was a little too slow in releasing the frisbee. 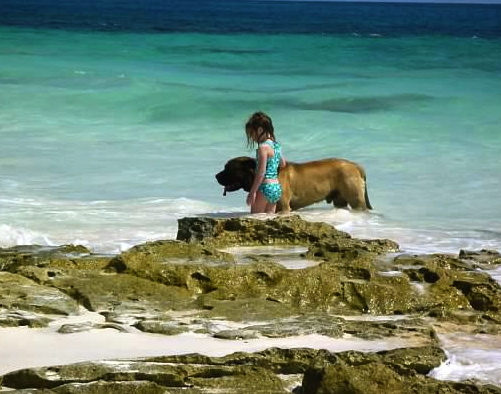 He’s a beauty and a beast, a self-appointed life guard, a gentle giant of a dog. love and hugs. . .asking God to comfort you.